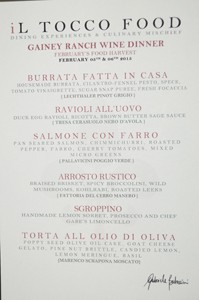 Chef Gabrielle Bertaccini of iL TOCCO has done it again! For the third year in a row he has presented the Gainey Ranch Estate Club with a marvelous evening. If you haven’t been to one of his hosted wine dinners, please don’t miss the next one! Five courses and five wonderful Italian wines, with a running discourse by Chef Bertaccini himself, with everything served in a quiet and intimate setting right in the Estate Club. Each year the Friday night dinner is sold out, and the overflow has gone to Thursday night. This year both nights were sold out. This is fine food and wine the way it was meant to be . . . relaxed, delicious, and intriguing. No course is overwhelming, each compliments the next, and all the while the Chef is there to describe what you’re enjoying. Everything is prepared on the premises at the Estate Club. The burrata salad was delicious, the duck egg ravioli amazing, pan seared salmon and braised brisket out of this world, with a poppy seed olive oil cake for dessert served with goat cheese gelato . . . unbelievable! This is one of the most entertaining evenings imaginable, and certainly the kind of community event not matched by other Scottsdale real estate complexes. Encourage the Estate Club staff to keep you posted on the date for the next visit from iL TOCCO and get your reservation in early. I promise you will be delighted.